After two months of its global launch, Nokia X7 will hit the Indian markets in June according to The Mobile Indian. The mobile phone is being marketed as an entertainment powerhouse; let's have a look at its specifications. The new smartphone from Nokia called the Nokia X7 runs on the latest Symbian operating system called Anna and has a 680MHz ARM 11 processor with Broadcom BCM2727 GPU. It has a 4 inch, AMOLED capacitive touchscreen with 640x360 pixels resolution and 16.7 million colours. The device also has a dedicated graphics processor with OpenGL 2.0 which enables 3D graphics. The internal memory of the mobile phone is 350MB, which is extendable up to 32GB with the help of a MicroSD card. An 8GB card is included with the device. It has an 8 mega pixels camera with third generation dual LED flash and can record High Definition (720p) videos at 25 frames per second. The device also comes with an FM radio for music lovers. The dimensions of the phone are 119.7 x 62.8 x 11.9 mm and it weighs at 146 grams. Nokia promises a talk time of six and a half hours, video playback of 6 hours and audio playback of an amazing 50 hours. The mobile phone also has a feature which helps in updating software Over the Air (FOTA) and Over the internet (FOTI). For a better web browsing experience, Flash Lite 4.0 is also provided in the device (a feature absent in the Apple iPhones). The mobile phone also has a USB 2.0 port which gives the device on the go support and helps the device become a USB mass storage device for storing documents and media content. The users of Nokia X7 will also get free lifetime walk and drive navigation including turn-by-turn voice guidance. The On-demand Web TV feature will enable users to watch channels like CNN, BBC and National Geographic via a 3G or a Wi-Fi connection. If the users add their favourite channels on the home screen they can get updates automatically about the arrival of new content. Additional channels can be downloaded at the Ovi Store (to be named Nokia Store) but the availability of channels depends on the region. 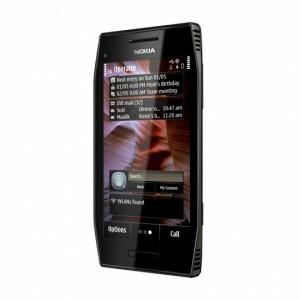 The price of the phone in India is not yet disclosed by Nokia but the Europe price of the device is 380 Euros. It seems like a good mobile phone but the problem lies in the OS, since Nokia has already declared that its future mobile phones will be Windows Mobile phones, Symbian is a dying breed of Operating system in Nokia mobile phones.